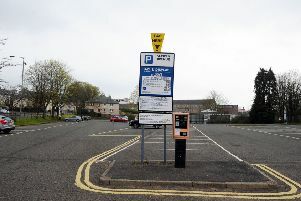 Pensioners are risking their health to give their custom to struggling businesses based at the old Falkirk Bus Station which has become a “ghost town” since its closure. That is the view of shop workers who are calling for First Bus to rethink the decision it made to pull out of its Callendar Road base in favour of operating from the Upper Newmarket Street hub in August. Employees of stores which are toiling to make a profit at the former bus station have witnessed first-hand the devastating impact the closure has had on the elderly, with reports of some customers being left physically exhausted and in need of medical treatment after making the journey on foot to their favourite cafe or shop. One business told the Falkirk Herald a blind customer once fell to the floor on arrival. Marion Mitchell, of Oliphant Bakers, said: “Our business has gone right down. “It’s not just affecting local businesses, it’s affecting local people. “One man walks here from Asda every day. He’s blind and collapsed and fell in the door one day because of the walk. It’s ridiculous. While some hardy OAPs remain determined to support the area’s shops, businesses have been left to count the cost of a lack of footfall since the bus station changed location. The prospect of shutting up shop due to the downturn is not outwith the realms of possibility for some premises, according to staff. Ms Mitchell continued: “We have told customers we’re struggling, some of them feel like crying. Nicola Vickers, of Eastgate Barbers, also backs the idea of reopening the facility in its original base. She said: “The bus station is like a ghost town — it was always busy. “It’s affecting us as customers from the flats don’t come down as often. “You don’t see a lot of passing trade. Quick Stop News owner Amir Yasin has worked in the area for 16 years. However, he is also facing up to the thought of calling time on his business, which remains at the old bus station. He said: “There’s no custom. It’s difficult for everyone and everyone has realised that now. First Bus chose to relocate to Upper Newmarket Street to create “new connections, more frequent buses and faster links” to busy locations. But a key failing that passengers have flagged up to the firm is a lack of accessibility experienced by the blind and partially sighted. Forth Valley Sensory Centre (FVSC) bus users have met with First staff and Falkirk West MSP Michael Matheson to express their concerns. FVSC manager Jacquie Winning said: “The closure of Falkirk Bus Station and the information centre has hit disabled passengers hardest. “Previously there was a set stance for each bus, now there are multiple buses using the same bus stop. For people who cannot see the bus numbers, this can be confusing. First Bus has stated it has no intention to return to its old base.